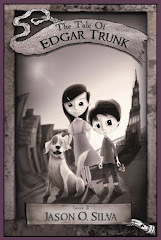 "Edgar Trunk is a ten year old orphan living in a horrid sludge factory. He has never been outside, not that this matters much since the grounds outside the factory are dark and rotting, as awful and lifeless as the factory innards. One day, he hears a mysterious knocking that seems to call him out of his tiny cell-like room. What he finds out about the factory and its other inhabitants changes the course of his life forever. This novel introduces us to the quiet but mysteriously important Edgar. He lives in a mysterious and magical world that is like and, at the same time, unlike our own. Did you notice that I've said "mysterious" lots of times so far? That's because this story is full of mysteries." Also, please check out his other reviews. The guy is awesome! A "random book" widget on the lefthand column is a great, quick way to discover new books.